The GunDivas: Lucky, Lucky Me! 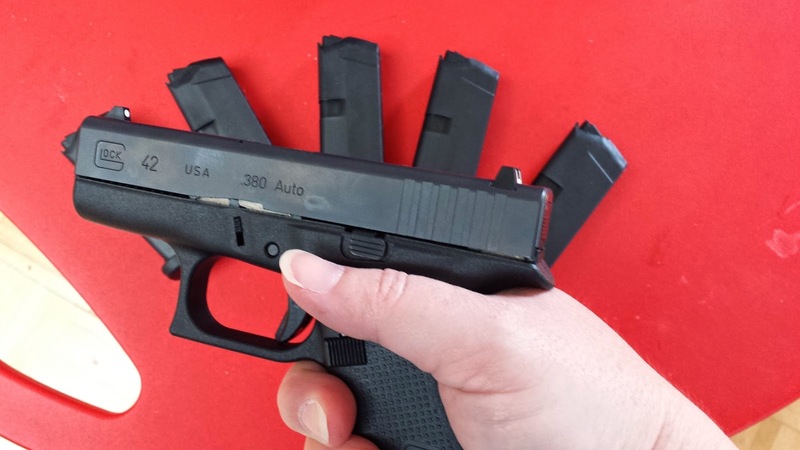 I picked up my Glock 42 this morning and it just so happened that the gun shop had extra magazines! I can now follow Mez's 3/5 rule. I'm very excited to have a Glock that actually fits my hand and can't wait to get it out on the range. Since I have enough magazines, I'll shoot it for the May defensive pistol match - I can't think of a better way to break it in. The Glock will get a paint job. I'm thinking a red slide with black overspray. Similar to the Para, but slightly in-your-face. Or ... I can make the Glock match Newt and go Alien II (green). I don't know yet, but I've got some time to think about it. Definitely Alien II green. With some red splatter. Finally - enough mags! Shoot Straight! I go with the Alien Green as well, enjoy! That's a pretty sporty little thang. Love the size and conceal ability. Show pics of the new color job. How many magazines do you need? The 3/5 rule!